♦ Display the number or name of incoming calls. ♦ Answer or Dial calls from your wrist. 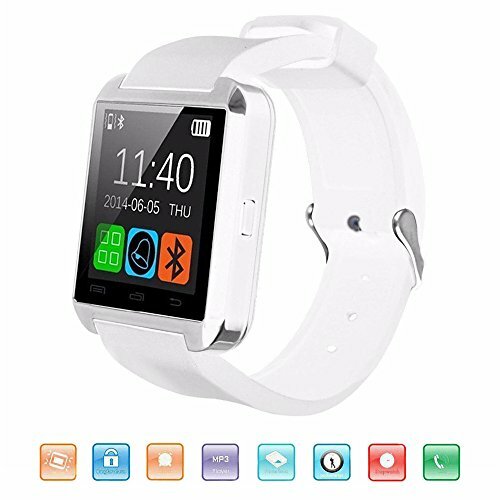 Android Phone can use this watch’s all functions; BUT IOS only support: Passometer, Calendar, Call Sync,Calculator,Clock,Stopwatch. 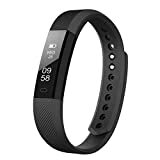 【FITNESS WATCH】Sleep Monitoring to help improving sleep quality, pedometer to record steps, various health tracking app designed to monitoring the situation of your sleep status, walking, calories burned. 【KEY CONFIGURATION】.44" TFT LCD Touch Screen to save the power, full charging the 230mAh rechargeable battery take about 1 hour, could support 3-hour phone call, 6-hour music play, stand by 160 hours. 【MORE FEATURES】BT Camera (Remote Shooting). Chronometer, calendar, calculator, sleep monitor, dialer, sync contacts / messages / call history, anti-lost, music player. All functions fully supported by Andriod smartphone. 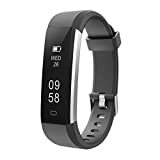 【MULTI ACTIVITY TRACKER】 Call Reminder, Answer Call, Dial Call,Message Reminder(iphone can't read the message)(not waterproof watch)(without heart rate monitor), Remote Control(only for Android phone,but smart watch has no built in camera), Push Message, Anti-lost, Pedometer, Sleep Tracker, Calendar,stopwatch & Many More(partial functions need use APP)! 【NOTE】For IOS Phone, The watch is not able to push Message and download APPs when you connect it to IOS. If for Phone 4/4S/5/5S/6/6 Plus, only supports call remind and music player through Bluetooth. We offer One year warraty to assure our product quality. ---Three pointers display on the dail: hour,minute and second pointer. ---Turn on App to check your daily steps and will automatically reset in the next day. ---Set your age ,weigt and steps and checking your walking distance and calories consumed on App. ---Check you sleep time and effective sleep time on App so that you can understand sleep status and update your sleep quality. 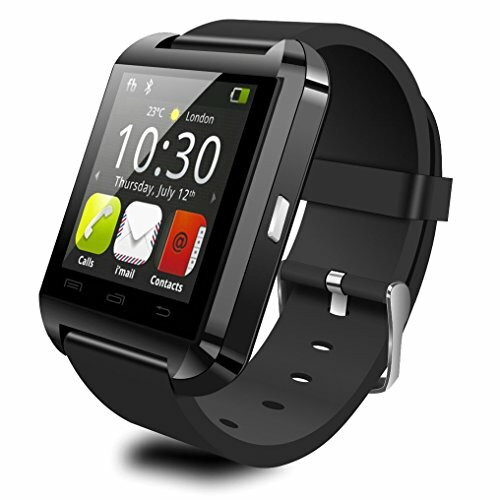 --- watch with music display interface,it can control the phone to play the song you like through watch. Android System can support all function in the description; not support iOS. 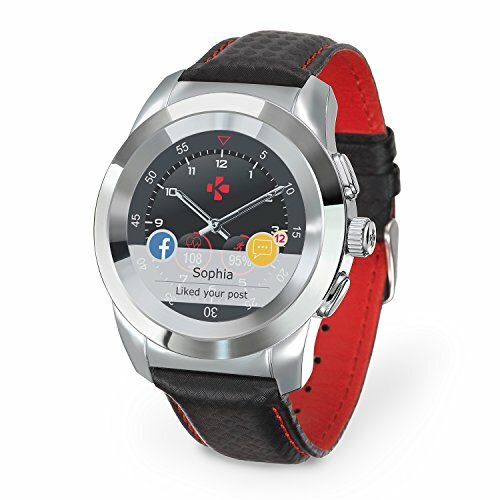 This is the Smart Watch that combines popular design with innovation technology. With silicone adjustable wristband and light weight, you can wear it comfortably anytime, like driving or running. What's more, it is the best companion for smart phone. When you have calls, it will remind you and you can receive calls by watch. You can call directly on it, as well as read your message and listen to the music after connected to your smart phone. Remote notify: sync the information from Twitter, Facebook, Skype,etc. All Android phones are competitable, including Samsung/LG/HTC/SONY/MOTO, etc. you might refere to the manual to download the APP before using some of the funtions. 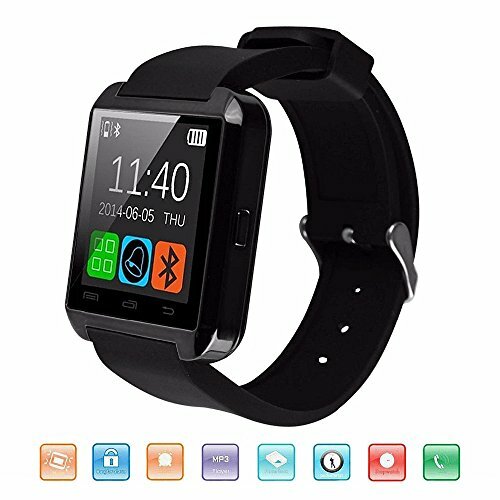 【MULTIFUNCTIONAL】Call Reminder, Answer Call, Dial Call,Message Reminder(iphone can't read the message), Remote Control(only for Android phone,but smart watch has no built-in camera), Push Message, Anti-lost, Pedometer, Sleep Tracker, Calendar,stopwatch and Many More(partial functions need use APP)! 【BLUETOOTH CONNECTION】Link with your blutooth, smart watches can support Hands-Free calls, Answer or Dial calls from your wrist,and Remote control your phone camera to take a photo. 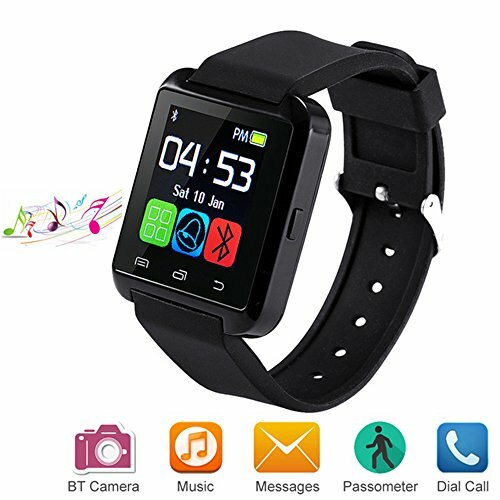 It's unnecessary to pick up and holding your smartphone to do above things; Incoming call displays the name & numbers; Missing Calls & SMS display as notification,Dial & Answer the phone calls with this smartwatch through Bluetooth. KeepGoo Bluetooth Smart Watch to take you into the smart life!! IOS only supports Passometer, Calendar, Call Sync,Calculator,Clock,Stopwatch but can not download the APPs. Message, Call log, Remote notification, Bluetooth music, Remote camera, Alarm, Calendar, Calculator, Sleep monitoring. Time / Date / Week / Battery state display. Bluetooth V3.0+EDR. 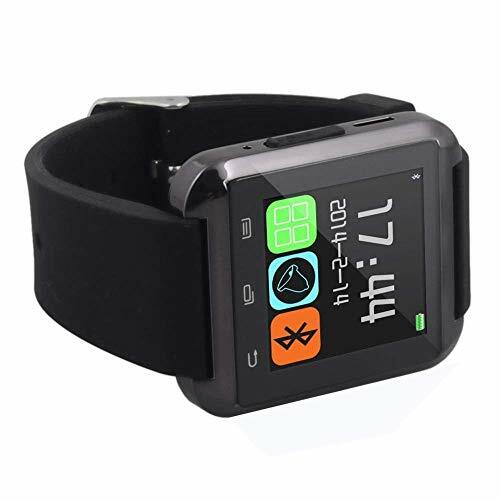 This is a new Bluetooth Smart U Watch which is compatible with all Bluetooth V2.0 or above enabled smartphones, tablets and PCs (support Android 2.3 or above), such as iPhone 4, 4S, 5, 5S, Sumsung S3, S4, Note 2, Note 3, Note 4 etc. 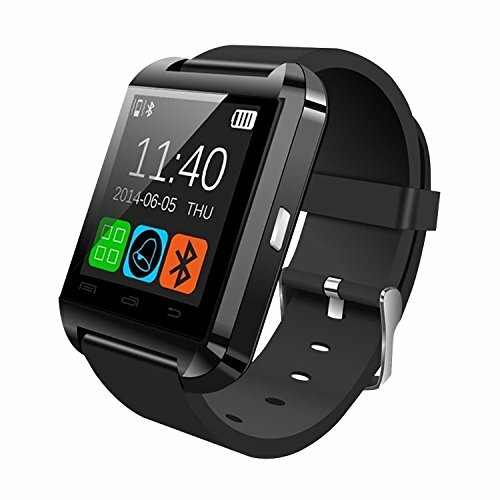 Introducing the iN TECH Bluetooth Smartwatch compatible with all Bluetooth smartphones. Watches aren't just for telling the time and date anymore, they can revolutionise your life. The iN-TECH Bluettoh Smartwatch is a must have accessory that can help streamline your day, make your life more efficient, and even improve your fitness and sleeping habits. 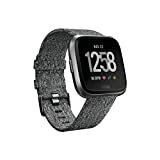 Connect and Sync: Easy as 1-2-3, just charge the Smartwatch, pair the watch and your smartphone together via Bluetooth connectivity, and you're away. 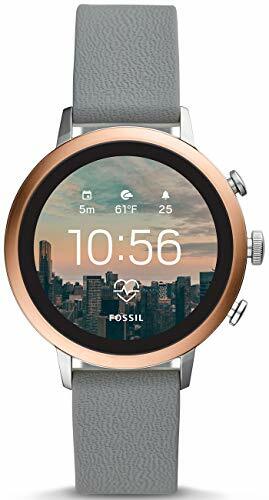 You can tailor the watch to your needs and personal settings; you can set it to alert you when a call or text message is incoming, pair it with compatible apps, take selfies with friends with its Remote Camera capability, note your daily steps with its pedometer, and even monitor your sleeping patterns. With some health apps you can change your day to day habits and feel healthier every day! 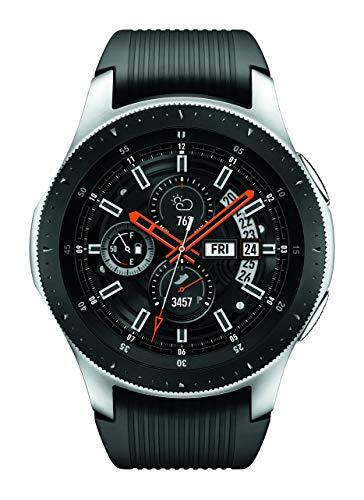 Battery Life: With a small but mighty 180mAh Polymer lithium battery, the watch can be on standby for up to 160 hours, and you can enjoy 3 hours of continuous talk time, and 6 hours of music playback. 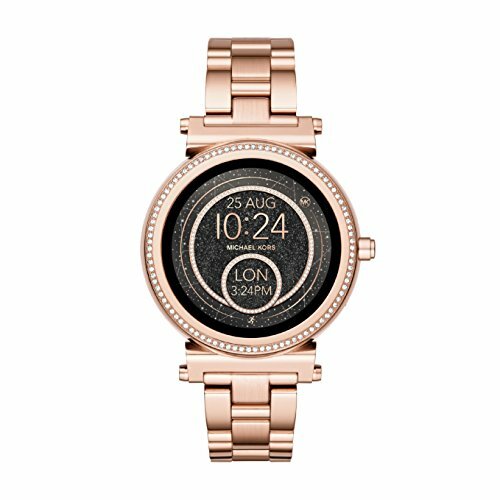 LCD Touch Screen: The watch boasts a touch sensitive 3.5cm (1.5 inch) Liquid colour display screen with interchangeable watch faces to suit your mood or personality. Please Note: Viewing text messages, calendar reminders and remote camera are not compatible with ISO Apple devices. 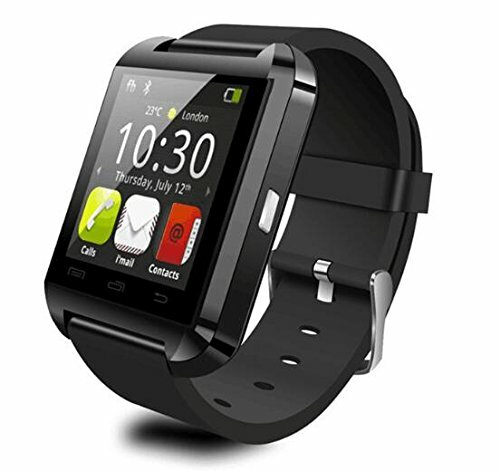 1.48" Capacitive Touch Screen TFT LCD Touch Screen smart watch. Best companion for smart phones; work after connected with smart phones via Bluetooth. Anti-lost alarm function: When cellphone left watch alarm automatically, after a certain distance to avoid lose the phone. Note: Android System can support all function in the description; But ISO only support: Passometer, Calendar, Call Sync,Calculator,Clock,Stopwatch. Compatible with all Bluetooth V2.0 or above enabled smartphones, tablets and PCs (support Android 2.3 or above),such as iPhone 4, 4S, 5, 5S, Sumsung S3, S4 etc.
. BUT ISO only support: Passometer, Calendar, Call Sync,Calculator,Clock,Stopwatch.
. Remote taking photo function:You can control your cellphone to take photo from your wrist.
. Compatible with all Bluetooth V2.0 or above enabled smartphones, tablets and PCs (support Android 2.3 or above),such as iPhone 4, 4S, 5, 5S, Sumsung S3, S4 ect. 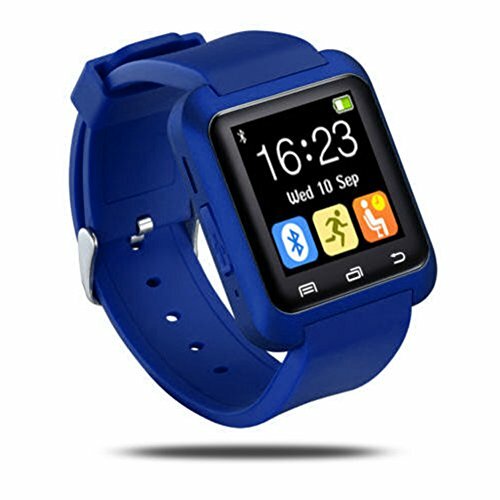 Bluetooth Watch U8: All functions are compatible with andriod smartphones, such as Samsung S3/S4/S5/Note 4/Note 3, HTC, Sony and so on.Note: The watch is not able to push Message and download APPs when you connect it to IOS. If for iPhone 4/4S/5/5S/6/6 Plus/7/7Plus, only supports call remind and music player through Bluetooth. Support calls handsfree: Easy to make and receive calls and read the message. Support Bluetooth MUSIC. Pedometer: Sports! Enjoy sports at home by recording your total calories. No more worry about missing important calls. 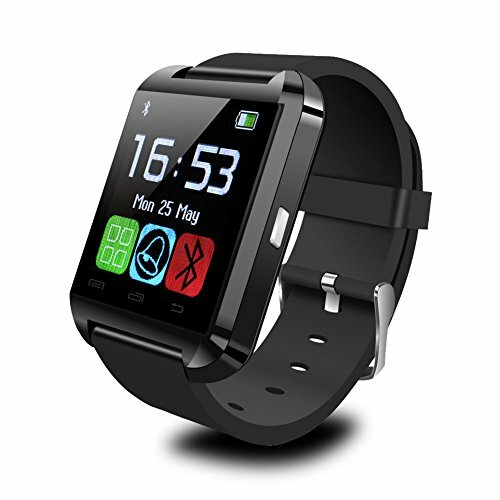 Intelligent Anti loss: When you smartphoneloin of over 10 meters, the watch will be ringing or vibrating automatically. More functions: BT Camera (Remote Shooting). Chronometer, Barometer, Altimeter, Clock, Calendar, Calculator, Sleep Monitoring, Dialer, Sync contacts / messages / call history, etc. Compatibility:Works perfect with Android 2.3 or above smartphones,Including SAMSUNG galaxy series LG ZTE HTC SONY HUAWEI NEXUS Xiaomi ONEPLUS etc. 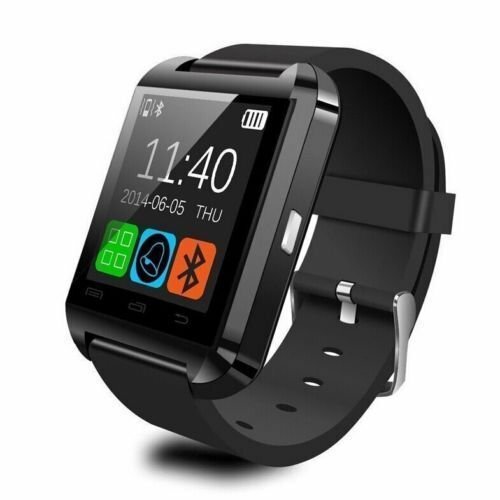 Open Bluetooth both on watch and smartphones,search the device from your smart watch by click Bluetooh Icon. Note1:All functions are compatible with andriod smartphones, such as Samsung S3/S4/S5/Note 4/Note 3, HTC, Sony and so on. Note2:The watch is not able to push Message and download APPs when you connect it to IOS. If for iPhone 4/4S/5/5S/6/6 Plus, only supports call remind and music player through Bluetooth. Material: Import PC + ABS plastic alloy structure.Rugged,Shockproof,Dustproof . Size fits most : 47*40*11mm/1.85"*1.57"*0.43". Comfortable to weaar and support calls handsfree,easy to make or receive calls and read the message. Compatible with Bluetooth 3.0 or higher smartphones,such as Apple iOS smartphone iphone 4 / 4S / 5 / 5C / 5S / 6 Android Samsung S5 / S6 / S7 / Note 4 / Note 5 HTC Apple, ect. Functions:Support hands-free calls, BT Camera (Remote Shooting),Chronometer, Barometer, Altimeter, Clock, Calendar, Calculator, Sleep Monitoring, Dialer, Sync contacts / messages / call history, etc. 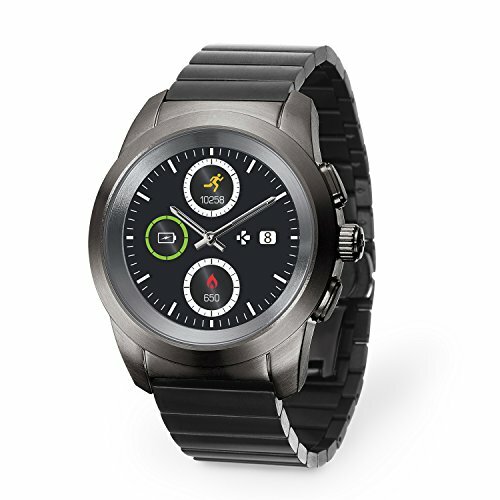 Android Phone can use this watch's all functions; BUT IOS only support: Passometer, Calendar, Call Sync,Calculator,Clock,Stopwatch. Supported all functions of android phones. Limited functions for Apple's ISO system. ONlY synchronization, clock, calendar, calculator,alarm clock function. Functions: anti-lost mode, energy saving, ringtones, the barometer altimeter (on the basis of the increase in demand ) pedometer, timer, a bluetooth device, a telephone directory, a clock information, call records, notification, the music, at a distance from the distal end a bluetooth to take photos, alarms, calendar, calculators, monitoring of sleep.